PearlArts Studios & Turner Intermediate School implemenent deep-dive units to teach core academic concepts using theater & dance. How often does a teacher tell their students to get out of their seats and dance around the classroom? That's exactly what students in grades 3-6 at Turner Intermediate School did to explore various topics from fractions and poetry to the rock cycle. The hope is that by addressing struggling students’ different learning modalities, long-term retention of often abstract concepts can be increased. Turner Intermediate School is one of two schools that comprise the Wilkinsburg Borough School District. As an inner-city community, Wilkinsburg's students often struggle to learn in the face of poverty and other obstacles that are not relevant to students in more affluent communities. The district itself recently emerged triumphantly from a period of intense problems that saw itself placed on the state's Financial Watch List, ultimately leading to the closing of its middle and high schools, among other things. As part of its reorganization, it created a STEAM program and in the summer of 2017, one of two newly assigned STEAM teachers, Timothy Weinstein, attended a summer program to learn about integrating arts into the STEAM classroom. While many people are familiar with STEM, incorporating the A for Arts requires somewhat of a paradigm shift. As he sat in the workshops, he was inspired by a comment made by one of the administrators urging teachers to "throw out the standardized test prep books that districts buy and pay an artist instead". He wondered how he could infuse the concepts of STEAM, not just in his classroom, but throughout the entire school. While the school already had music and visual arts teachers to teach those subjects, it did not have dance and theater professionals, let alone ones capable of using those art forms to teach core academic subjects! With this in mind, Mr. Weinstein contacted Staycee Pearl at PearlArts Studios, a local dance company with experience in teaching dance classes to inner-city students to propose his innovative teaching idea. Working with Genna Styles, Director of Education and Outreach for PearlArts Studios, teachers at Turner Intermediate co-planned lessons around topics they felt best matched with the kinesthetic modality used in dance and theater. Students learned a plethora of topics including magnets, verbs, fractions and ratios, biomes, types of sentences, the rock cycle, types of symbiotic relationships, the water cycle, and polygons, among others. In addition to this academic focus, students were introduced to basic dance and theater techniques along with activities that presented a variety of musical and dance genres as they attempted to instill an overall appreciation for the fine arts. A typical lesson started with a brief video to grab students' attention. They then headed to the dance floor to warm up their bodies. This was followed by a brief discussion of the academic concepts for the lesson. No two lessons were ever the same. In some, students worked with a partner to create a gesture or brief dance that showed an understanding of the topic as when they were challenged to act out different types of sentences (imperative, declarative, interrogative or exclamatory) without words. As students performed their gesture or dance, the rest of the class tried to guess the sentence. Other lessons saw students work in large groups, as when they were challenged as a class to collaborate to determine factors and multiples using their bodies as manipulatives. Yet other lessons had the students learn a dance taught by the resident artist as when they first created dance moves for the different steps of the water cycle and then performed them in order. The only commonality from one lesson to the next was the ownership that students took in the unique works of art they created. Although many students were, at first, reluctant to accept this unique approach to the STEAM "classroom", through the gentle guidance of various master instructors LaTrea Rembert, Jessica Marino, Sarah Janosky and C.J. Lee, they slowly began to enjoy the experience. 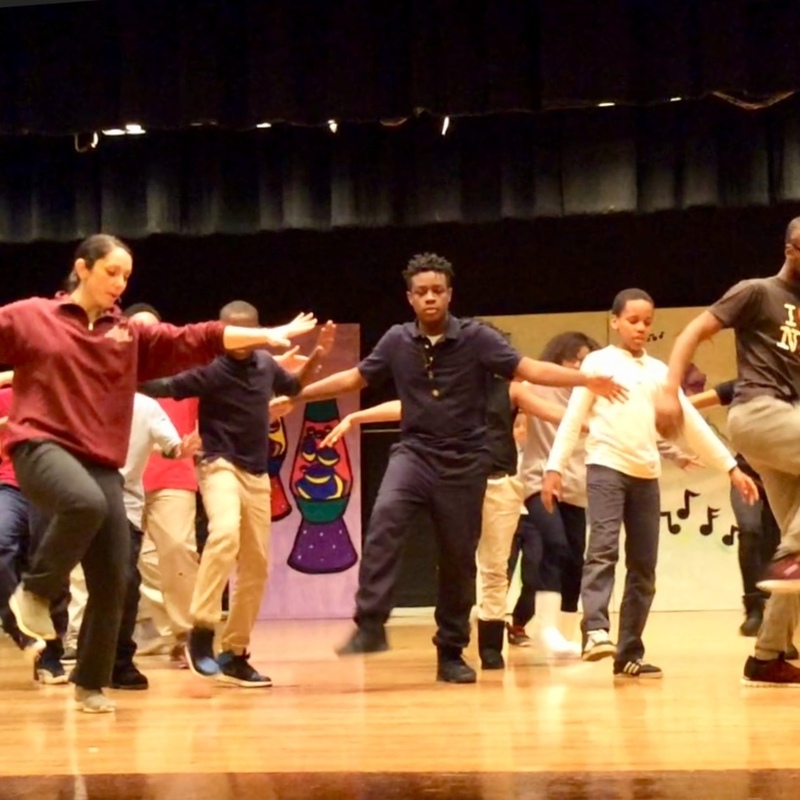 By the end of each unit, not only had many students learned to appreciate new forms of art, they also learned a few new dance moves, and most importantly, some core academic concepts in preparation for the Pennsylvania System of School Assessment (PSSA) tests! This program proves that through deliberate collaboration, even seemingly disparate concepts such as poetry, science and modern dance can be effectively melded to create a unique educational experience for not just struggling students, but for all students. Who ever thought that they would see a group of students create a dance that accurately shows the components of the rock cycle or a marine biome? We are very grateful to the numerous foundations (including the Grable and Benedum Foundations along with Remake Learning) for helping to establish the STEAM program at Wilkinsburg Borough School District. This Artist Residency Project was supported, in part, by the Arts in Education Partnership of the Pennsylvania Council on the Arts, a state agency funded by the Commonwealth of Pennsylvania and the National Endowment for the Arts, a federal agency. The Arts in Education Partner serving Allegheny, Beaver, Greene, and Washington counties is Pittsburgh Filmmakers/Pittsburgh Center for the Arts. Locating the right arts partner is critical to the success of your program. You may already be comfortable teaching dance and/or theater along with academics and are highly qualified for this role. Few are however. In that case, creativity will be key to finding someone who can help you. At this point in planning, you will identify key academic concepts that you want to reinforce through kinesthetic learning. You will also identify the vocabulary terms that you will incorporate into your lesson. In this step, you modify the existing teaching schedule, if needed, to accommodate the time each lesson might take. The final step to successfully teaching core academic concepts through dance and theater is to abandon your traditional views of education and embrace the unique experience of this novel approach to learning.